MVCTC Veterinary Science and Fab Lab students represented MVCTC at the 2019 Ohio ACTE Career Technical Education Student Showcase on March 13, 2019, in Columbus. Left to right - Eryn Oldham (Veterinary Science student from Milton-Union), Jordan Green (Robotics and Automation student from Valley View), Dennis Perkins (Precision Machining student from Valley View), Ohio 43rd District Representative Todd Smith, Rachel Sherman (Veterinary Science student from Northmont), Myckala Geisler (Veterinary Science student from Miamisburg), and Carley Asher (Veterinary Science student from Preble Shawnee). COLUMBUS — Miami Valley Career Technology Center Veterinary Science and Fab Lab students represented MVCTC at the 2019 Ohio ACTE Career Technical Education Student Showcase on March 13 in Columbus. 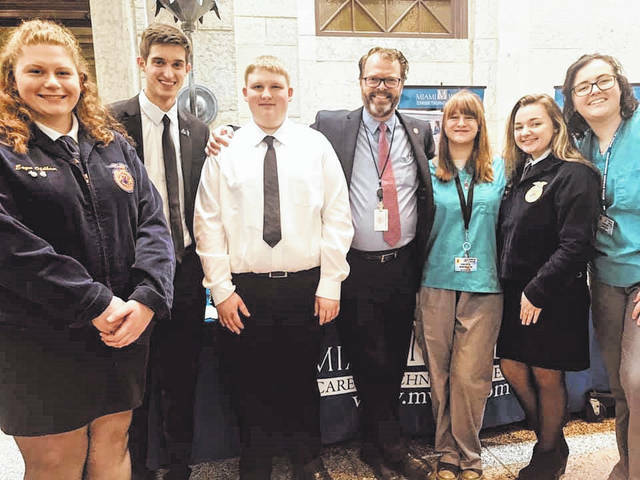 Students had the opportunity to share their programs at MVCTC with state legislators and their staff as well as tour the Ohio Statehouse and meet students from other career technical programs in Ohio. Students attending from Veterinary Science included Eryn Oldham (Milton-Union), Carley Asher (Preble Shawnee), Rachel Sherman (Northmont), and Myckala Geisler (Miamisburg). The students representing Fab Lab included Jordan Green (Robotics and Automation student from Valley View) and Dennis Perkins (Precision Machining student from Valley View). MVCTC Veterinary Science and Fab Lab students represented MVCTC at the 2019 Ohio ACTE Career Technical Education Student Showcase on March 13, 2019, in Columbus. Left to right – Eryn Oldham (Veterinary Science student from Milton-Union), Jordan Green (Robotics and Automation student from Valley View), Dennis Perkins (Precision Machining student from Valley View), Ohio 43rd District Representative Todd Smith, Rachel Sherman (Veterinary Science student from Northmont), Myckala Geisler (Veterinary Science student from Miamisburg), and Carley Asher (Veterinary Science student from Preble Shawnee).